Stilleben mit gelben Rosen is the title with which Beckmann recorded the present painting in the 1937 inventory of his work. It was painted in Amsterdam at a time of emotional tension following his flight from Berlin the day after the Führer opened the Entartete Kunst (Degenerate Art) exhibition, aimed at deriding modern art, at the Haus der Deutschen Kunst in Munich. The ten years he spent in exile in Amsterdam, with sporadic stays in Paris, were a fairly fruitful period in which he painted some of his most important triptychs and allegorical compositions. As a result of the emotional crisis he suffered, Beckmann took refuge in a mythological imagery that denounced the horror and ravages of Nazism. As a counterpoint, he also painted a series of still lifes and landscapes devoid of any allegorical allusions or any type of political denunciation. In the present Still Life with Yellow Roses the composition is centred on the vertical yellow strips that link the yellow roses in the central area with the ears of corn in the upper left corner. Around them the greenish and earthy shapes of the curtains, chair and door serve to define the crammed space in which is set the pedestal table with the jug, on which two reed pipes, a music score and a dish of pears appear to stand. The black of the contours unifies the forms so greatly that some of the elements are difficult to discern. The frontal arrangement of the pedestal table — which Beckmann had used in Still Life with Gramophone and Irises — and the exaggerated flatness of the composition recall the Post-Cubist still lifes of Georges Braque of the 1920s and 1930s. 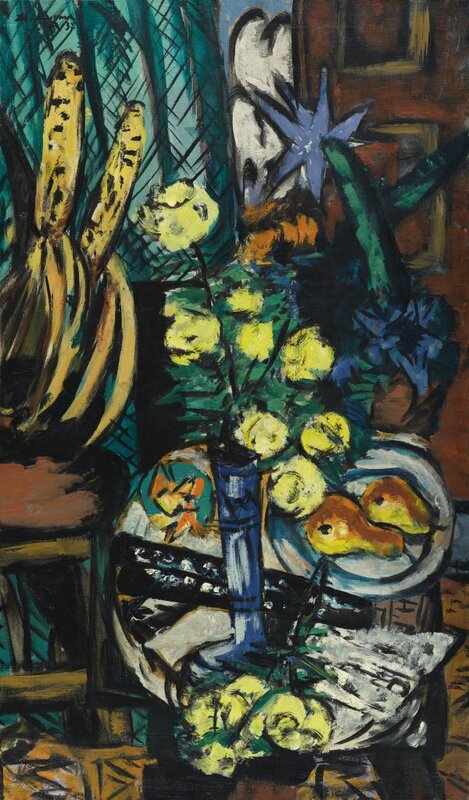 As with the portrait of Quappi, the first owner of the present still life was Stephan Lackner, who promoted Nazi-censored artists outside Germany. Lackner bought the picture from Beckmann in 1938 and in April 1939 took it with him on his exile in America, from where he kept up correspondence with his friend. In July 1938, during the preparation of the exhibition of Twentieth Century German Art at the New Burlington Galleries in London, in which Lackner was actively involved, Beckmann travelled with his friend to the British capital to deliver a lecture entitled “On my painting”, in which he stated, among other things: “I hardly need to abstract things, for each object is unreal enough already, so unreal that I can only make it real by means of painting.